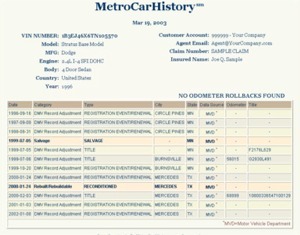 Want to know if the car has been titled in more than one state, been in an accident, stolen, salvaged? Does your insured vehicle have 40,000 miles on it or does it really have 140,000 miles? MetroCarHistory can tell you. See if your insured is telling the truth about their vehicle! Save your company thousands in false claims with one simple report. MetroCarHistory searches through 16 billion records on more than 320 million cars instantly, with one piece of information, a VIN. The information displayed will show you the city and state of where the vehicle has been registered, recorded title numbers, odometer readings, accidents and any adverse events that have been recorded by a state Department of Motor Vehicles. The report will span the time of when the vehicle was first put into service (when it was new), until the most current point in time on record. The information pertains to the vehicle only. No personal information is disclosed. Click the above image to show a sample output screen.